Models are proud to announce they have joined Sacred Heart Mission’s dazzling line-up for the 10th anniversary of its annual fundraiser, The Heart of St Kilda Concert at the Palais Theatre St Kilda, on Tuesday 28 November. Models will be performing alongside James Reyne, John Paul Young, Tim Rogers, Leo Sayer, Courtney Barnett, Jimeoin, Adalita, Dave Callan, Rebecca Barnard, Billy Miller & the Caravan Choir, The Meltdown and D²Drumline. The Heart of St Kilda concert is the annual highlight of the Melbourne live music and comedy calendar. It attracts Australia’s finest musicians and comedians who donate their time to support the work of Sacred Heart Mission and its Meals Program, which provides up to 400 hot and hearty meals daily to those in Melbourne experiencing homelessness, social isolation and disadvantage. The Mission serves over 160,000 meals each year out of its dining hall in Grey St, St Kilda and once again proceeds from this year’s concert will continue this inspirational work. The show will again be MC’ed by irrepressible RocKwiz co-presenter and ABC Melbourne broadcaster Brian Nankervis. 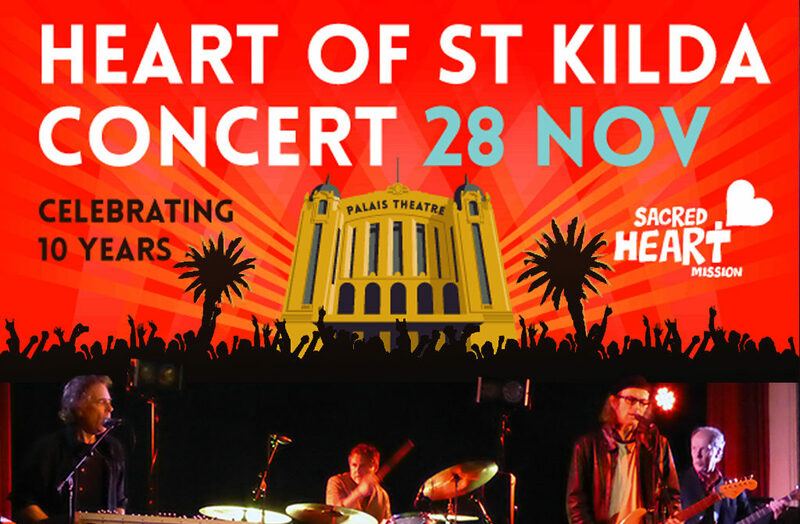 Continuing a tradition set up ten years ago by committee members Wal Bishop OAM, Larry Ponting, Neil Croker and Brian Nankervis, the Heart of St Kilda Concert is a totally unique, celebratory night of entertainment for the whole family, helping to raise funds for a vital cause. Sign up for exclusive updates, exciting news and entertaining banter!